The overall environment at The Pavilion at Grace Haven is spectacular! It is truly a hidden gem in the wedding venue market in Wake County. Bordered by a long gravel driveway on one side and small stream on the other, the natural beauty of the venue is unbelievable. In the fall, the late afternoon sun casts soft light on the entire ceremony site while illuminating the background of colorful hardwoods. Couple the natural beauty with the hand laid stone through out the venue and you have an outstanding location for your nuptials. With all the beauty at this site, choosing a location for a bridal portrait on the day of a wedding is a bit daunting. However, the bridge, being a visual representation of crossing from being single to being married, is a great spot. The dark stone is hand laid and evenly spaced with the bridge covered in a light coat of dark mulch. The background is a blend of colors, ranging from dark greens in the spring and summer to oranges and reds in the fall. Take the dark stone and mulch coupled with a dark and colored background, you have the perfect location to place a bride in her white dress and really make her stand out naturally! The one issue - the bridge is heavily shadowed. 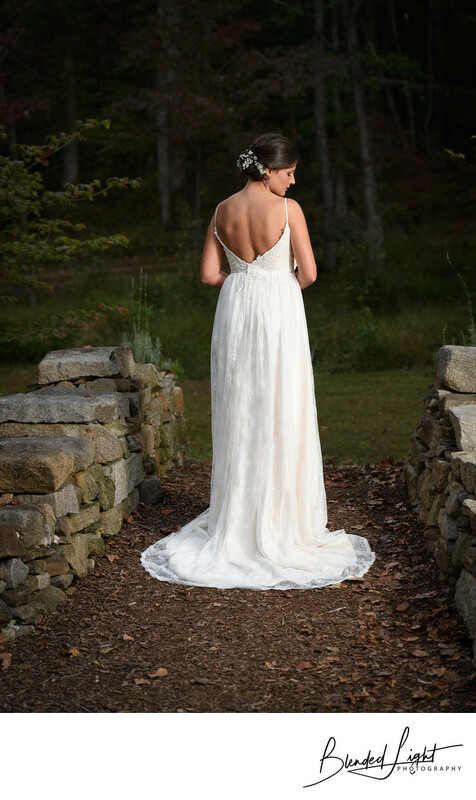 So, bring in a little flash, have your bride turn her back to you, look over her shoulder and the focus of the image becomes the scooped back of the dress - my bride's favorite part of her dress. If you are looking for an outdoor wedding venue that has gorgeous surroundings and won't break the bank, you might consider looking into the The Pavilion at Grace Haven. And I would love to be able to provide you with stunning portraits, so please contact me if I can help in any way! Location: The Pavilion at Grace Haven, 726 Hicks Road, Youngsville, North Carolina 27596. 1/160; f/3.5; ISO 800; 82.0 mm.